Not to be confused with Ayni Air Base. 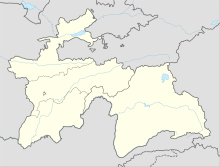 Farkhor Air Base is a military air base located near the town of Farkhor in Tajikistan, 130 kilometres (81 mi) southeast of the capital Dushanbe. It is operated by the Indian Air Force in collaboration with the Tajik Air Force. Farkhor is India's first military base outside its territory. Chabahar Port in Iran, developed by India, provides India surface transport access to Farkhor Air Base via Afghanistan. In 1996-97, Indian intelligence agency, Research and Analysis Wing (RAW) started negotiations with Tajikistan to use the Farkhor airbase to transport high-altitude military supplies to the Afghan Northern Alliance, service their helicopters and gather intelligence. At that time, India operated a small military hospital in the Farkhor region. The hospital at Farkhor was used to treat Afghan Northern Alliance members injured in fighting with the Taliban, including military leader Ahmed Shah Massoud, who was rushed there after a suicide attack against him. In 2002, India acknowledged that it was setting up an air base in Farkhor. It was secured with assistance from Russia. The airbase was in a dilapidated condition and was not used since the 1980s. The Indian Government awarded a $10 million tender to a private builder in 2003 to restore the airbase by 2005. After the builder defaulted, the Border Roads Organisation stepped in to complete the work. In 2006, India was considering deploying a squadron of MiG 29 aircraft at the base. The Farkhor Air Base would give the Indian military the required depth and range in seeking a larger role in the Indian Subcontinent and is a tangible manifestation of India’s move to project its power in Central Asia, a policy goal formally enunciated in 2003/04. The potential implications of this base go far beyond the Indo-Pakistani rivalry on the subcontinent. Pakistan fears being encircled by India with the base in Farkhor operational. In 2003 the President of Pakistan Pervez Musharraf raised concerns to the Tajik government over the fact that Indian planes would be able reach Pakistan within minutes using the air base. ^ a b c "Making the water boil in Afghanistan". The Hindu. 9 July 2008. Retrieved 1 February 2012. ^ Bhardwaj, AP (2010). Study Package For Clat 2nd Edition. Tata McGraw-Hill Education. pp. B-349. ISBN 0-07-107468-6. ^ a b "India to station MiG-29 fighter-bombers at Tajikistan base". The Tribune. 22 April 2006. Retrieved 1 February 2012. ^ "India And Tajikistan Ties: Partners In Development – Analysis . ", Eurasia Review, 4 March 2017. ^ "India to open military hospital in Tajikistan". The Times of India. 21 November 2011. Retrieved 1 February 2012. ^ "Indian military shadow over Central Asia". Asia Times. 10 September 2002. Retrieved 1 February 2012. ^ "India, Pakistan and the Battle for Afghanistan". Time. 5 December 2009. Retrieved 1 February 2012. ^ William H. Keith, Stephen Coonts (2011). Death Wave. Quercus. p. 4. ISBN 0-85738-520-8. ^ "India-Afghanistan Relations". The Washington Post. 23 October 2008. Retrieved 1 February 2012. ^ "India to base planes in Tajikistan". The Tribune. 15 November 2003. Retrieved 1 February 2012. This page was last edited on 13 March 2019, at 17:28 (UTC).